In the city itself, Christmas Eve Mass was celebrated at the 1,700-year-old Church of the Nativity, on the spot where it is believed Jesus was born. 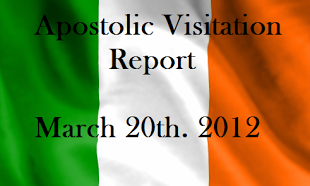 Meanwhile in the Vatican, Pope Benedict XVI held the traditional Mass at St Peter's Basilica. He urged Christians to "find time and room for God in their fast-paced lives". The Pope prayed that Israelis and Palestinians would be able to live their lives in peace. He also prayed for peace in Lebanon, Syria and Iraq. The Mass, usually celebrated at midnight, was brought forward by two hours to avoid tiring the 85-year-old pontiff unduly. Later on Tuesday, the Pope delivered his traditional Christmas message - Urbi et Orbi - to the city of Rome and to the world. In Bethlehem, the head of the Roman Catholic Church in Jerusalem voiced his support for a Palestinian state. 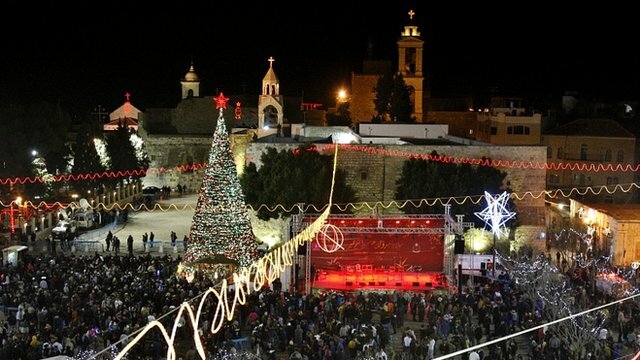 Latin Patriarch Fouad Twal said this Christmas would be a celebration of "the birth of Christ our lord and the birth of the state of Palestine". "The path [to statehood] remains long, and will require a united effort," he said. The patriarch, who was born in Jordan, led a symbolic procession from Jerusalem's Old City to the West Bank city, passing through the separation barrier and checkpoint built by the Israelis. He was met at the church in Manger Square by thousands of tourists, pilgrims and clergy. The patriarch later held the Mass at the Church of Nativity. "From this holy place, I invite politicians and men of good will to work with determination for peace and reconciliation that encompasses Palestine and Israel in the midst of all the sufferings in the Middle East," he said. And referring to last month's hostilities between Israel and Gaza militants, the patriarch said his prayers included "all Arab and Jewish families that have been touched by the conflict". Palestinian leader Mahmud Abbas was present at the Mass. In November, the United Nations upgraded the status of the Palestinians to that of a "non-member observer state". Israel - strongly backed by the US - opposed the move, describing it as a Palestinian ploy to bypass stalled peace negotiations. The Church of Nativity is located in an area of the West Bank governed by the Palestinian Authority. In June, the church was formally named a Unesco World Heritage Site - the first to be nominated by the Palestinians, who were made full members of Unesco earlier this year.